Great west side location! 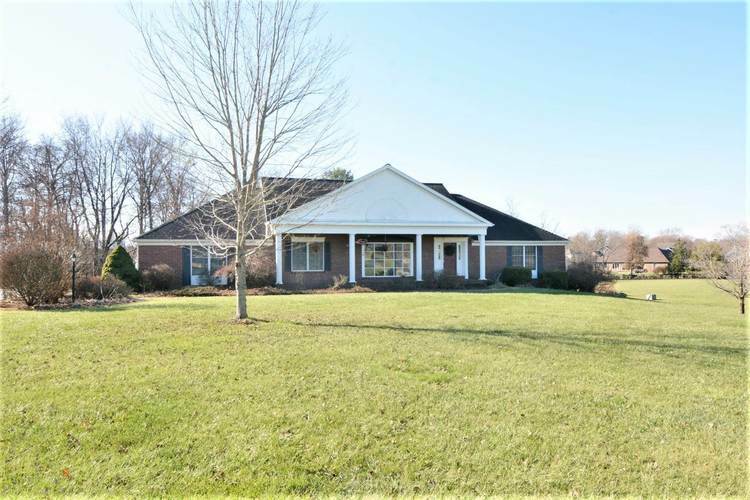 Sitting on over 1.4 Acres this full brick ranch offers 2583 sq ft up and 645 sq ft down, 3 bedrooms, 3 full baths with a walkout basement. It's set back from the road offers a stately feel as you arrive. Large covered front porch to keep you out of the weather and a good place to relax. The entry boast a high ceiling, ceramic tile flooring and is open to the living room, dinning and great room. The great room is just that a great size space, unique beamed ceiling, fireplace and twin atrium doors leading to the back patio. The kitchen includes all appliances, a preparation bar, pantry and a cozy eat-in area with bay windows. Coming in from the garage you'll find a full bath and large laundry area with access to the back yard, perfect should you want to add a pool in the future. The master suit is located privately at the end of the hallway, it is very spacious with double door access to a large bath that includes a whirlpool tub, separate shower, double vanities and a walk-in closet from the master. There is also access to the back patio from the atrium door off the master. This home has a good number of closets and lot of storage, the garage has a 9' x 17' off set as well as the basement utility space for all those treasures. New carpet 2018 all areas accept front living space. Roof new in 2006. The basement includes a B-dry system with warranty. Directions:From the Lloyd north on Schutte stay straight at the 5 way stop to left on Woodward.